When Larry Bird joined the Celtics in 1979, I was just nine years old, dreaming about playing for the hometown team some day. My Dad and I attended just about every game at the Boston Garden. The place was dead. Bird came in and transformed everything, like Swayze waltzing into the Double Deuce and cleaning house in "Road House." He wasn't just great, he changed the way his teammates played. He brought everyone to a higher place. Of the 50 happiest moments of my life, Bird and the Garden were involved in at least a dozen of them. 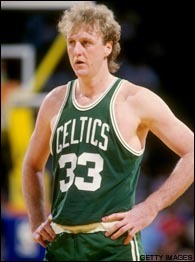 Larry Bird's game and the emotion he created in Boston was palpable. Does that make him a hero? Probably not. He wasn't saving lives, he wasn't putting his own life at risk, he wasn't making the world safer or anything. At the same time, I can't imagine what my life would have been like without him. We grew up together over the years. He won three championships and three MVP awards, helped save the NBA, rejuvenated the Celtics franchise. During that same time, I hit puberty, graduated from high school and college, even started living on my own. By the time his career ended in 1992, my life was just beginning. Ever since I was little, I loved basketball more than just about anything. Randomly, inexplicably, coincidentally, the greatest team basketball player of my lifetime landed on my team, in my formative years, and I had the privilege of watching him, day in and day out, for 13 years. His work ethic and his competitiveness rubbed off on his teammates. He always rose to the occasion when it mattered. His passing was contagious. When you watched him long enough, you started to see the angles he was seeing; instead of reacting to what just happened, you reacted to the play as it was happening. There's McHale cutting to the basket, I see him, get him the ball, there it is ... LAYUP! Bird gave that to us. So that's what I grew up watching -- basketball played the right way. People looking for the open man. People making the extra pass. People giving their best and rising to the occasion in big moments. Even years later, I can rattle off the classic Bird moments like I'm rattling off moments of my own life. Like the time he sprung for 60 against Atlanta, when the Hawks were high-fiving on the bench. Or the time he dropped 42 on Doctor J in two-and-half quarters, frustrating Doc to the point that they swapped punches at midcourt. Or the famous shootout with Dominique in the '88 playoffs, when they combined for 34 points in the final quarter. I have a hundred of them.